He’s a saint and a centaur, and also the little boy down the street. Today’s Name of the Day is the Celtic charmer Ronan. You can spot the Atlantic grey seal and the Harbour seal on the coast of Ireland. Rón is the Irish for seal; adding the diminutive “an” turns the name into “little seal.” It’s not clear how – or exactly when – the term leapt from the sea creature to human beings. Still, it strikes us as a neutral meaning for a name – neither inspiring nor off-putting. Plus, we love the sound of Ronan – RO nin – with that ever so current “o” sound. It’s been worn by plenty of real and fictional figures, giving the name the kind of character that develops over long use. The earliest Ronan in the historical record was a Celtic bishop who preached the faith in sixth century Cornwall and Brittany. Check the map and you’ll find an ancient village in France, Locronan, was named in his honor. It’s stunningly picturesque – if you’ve seen the 2004 romance A Very Long Engagement, then you’ve spied Locronan. St. Ronan is sometimes confused with his contemporary, St. Rumon – or they might even be the same person. 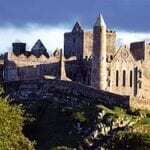 At about the same time, the Irish province of Leinster was ruled by King Ronan. The name was fairly common in early medieval Ireland and has been used sparingly ever since, gaining momentum in the 20th century. A few notable Ronans include Irish pop star Ronan Keating; writer Ronan Coughlin; and rugby player Ronan O’Gara. Two other well-known Ronans are fictional – a centaur in the Harry Potter series and a bad guy in the Fantastic Four comics. Today it’s a Top 50 choice in Ireland, and is also heard in Scotland and Canada. In the US, Ronan first entered the Top 1000 in 2001 and has climbed steadily since then. As of 2007, it ranked #554. Given the dizzying heights that Aidan has reached, and the popularity of Ryan, Connor and Sean, it’s little wonder that parents have started to dig deeper for authentic Gaelic heritage choices. Ronan works well because he’s a little bit different from any of the more popular choices, but has plenty of backstory of his own. We quite like this name, but we’re biased by the darling, chubby 10 month old Ronan a few doors down from ApMtn HQ. He has a father and two big brothers with shamrock green appellations of their own, so Ronan fits in perfectly with their clan. And, truth told, it’s the kind of name that fits well in our neighborhood – unexpected but not unfamiliar. Given his recent race up the charts, we’re calling it a Hot Name for 2010, and we’ll be on the lookout for more small Ronans in the next few years. I love Ronan and Isla as a sibset! It’s gorgeous and I can understand why you’re having so much trouble finding a third name to go with it. Have you thought about using another Irish saint for a little boy? My first thought would be Cormac or Dermot, neither would have a spelling to pronunciation issue that Irish Gaelic names often have. For a girl I like Niamh with your two (but I am biased around that name :)). Or away from Irish names how about Phoebe? For a boy: Lachlan! It’s a huge hit in Australia, yet rare in the U.S. Owen would fit in seamlessly with the names of your other two children, although it might be too popular for your taste. Fiona would be stunning on a little girl. You might want to check out the baby names forum on mumsnet, the UK site – they would probably have some great Celtic suggestions. Best of luck! John Ronan & Isla…. so nice together! The only Ronan i know has a sister named Vienna… i always liked how those sounded together. Ronan Gregory was our name choice if our last little one had been a boy (we were surprised with twin girls instead!) We already have a Liam, a Calum and an Isla. Our new little girls are Rhiannon and Aria. Some suggestions: Owen, Calum/Callum, Silas, Eamon, Ian, Alasdhair (Alastair). For girls, I love Maeve (it’s my Isla’s middle name), Aoife, Niamh (my Aria’s middle name), Anya, and Epona. Good luck! I named my youngest son born March 31, 2008 Ronan. My wife and I thought this would be a good middle name, after thinking about what ould be a good first name to go with it we decided we liked it so much why not give it to him as a first name. My wife and I both grew up on the coast so harbor and grey seals are familiar to us, it was our way of naming our son after the sea. We also thought it was different but not too different that he would be teased on the play ground. After deciding our son needed a good Irish Catholic name we went with Ronan Xavier, a good strong name that he will grow into. My baby brother answers to Rohn, so we’d probably skip Ronan/Rowan/Rohan in favor of tucking Rohn in the middle spot somewhere. Not that we’re having any more children. I think. Kayt, it is crazy how you’ll meet someone with such a weird assortment of naming styles – I wonder if one parent chose some names and the other won out the rest of the time? Because Skylynn? Shiver! But I love their other girls’ names. Friend of a friend, Corbin it is for August 12. I do remember Corbin Bernsen from LA Law, and there’s also a Corbin Bleu from the cast of High School Musical. I haven’t a clue about his origins, so it will be fun to find out! My last name is Ronan, First name is Kevin… Ronan= little seal, Kevin=handsome at birth. Ronan is a very old Irish name from the SouthWest I believe, around Munster, Near Cork. Ronan sounds so “brutish” to me though your right, it’s a better alternative to some of the other -an sounding names out there. I do like the Ro- sound though, but I think I may prefer a Rory. Have you ever written about the name Corbin? I love this name and I haven’t heard it used much. I think there’s a famous actor named Corbin out there and it’s also the name of the character played by Bruce Willis in The Fifth Element. I think it’s English? It’s a great choice! I love how authentically Irish it is wihout being Aidan, Connor, etc. I would love to hear him in my neighborhood, but I live near a bunch of Skylynns and Sammys and Jaydens. I actually have a neighbor with five kids, and overall, they don’t have awful names. They have an Aisling, a Danica, and a Brenna, but they also have a Skylynn and and a Jayden. Weird, huh? I quite like Ronan. I have a thing for Celtic names but I think I’ll put this with Rowan. They’re getting far too popular and they’re being used on girls, which I don’t like. I’m not such a big fan of unisex names and like DirtyHippy, -en boys’ names are far too popular for my liking. I’ve actually met a baby girl with this name . . . grrr . . .
Ronan is fine, but with the popularity of all the “-en” boys names around me (I’m drowning in a sea of Colins, Landons, Masons, Aidans) it doesn’t strike me as a particularly inspired choice. There’s tenor Ronan Tyan too and call me Geek, but Ronan Dex is a character on Stargate Atlantis played by Jason Momoa, as well. I find his look smooth, his manner snappy and upbeat and very dashing. I’ve met two in Boston within the last year, so it is starting to catch on in here in heavily Celtic MA. He’s actually my preferred R-n name, of the ones you listed, Roman’s too ‘Roman” and severe for me and Roan’s too horsey for my liking. But Ronan’s snazzy and cool! He gets a huge :thumbsup: from me! […] looking for help naming her third, gender unknown (but she thinks its a boy!). […] big girl bike from our local bike shop. […] and fictional re-tellings abound. […] think Eamon works as an authentic Irish heritage name, though choices like Ronan might be easier to pronounce and even spell. […] the diminutive “an” ending is common in Irish male personal names – think Aidan and Ronan.